My favorite part of the manuals is that they have the 1,2,3 keys arranged backwards in the drawings. I think you just did a *FANTASTIC JOB* Ken. I re-read the whole page, and the simulator you kindly posted ket me touch the dream of having that calculator within my grasps... an unbelievable opportunity for me... Thanks! A hint: why not put a nice blue-violet background to the display, instead of black? Of course these are only cosmetic changes... nothing to do with the real ard work you did!!! The trig algorithm is just a simplified form of CORDIC, no? Single stage, base 1000, using .001 as an approximation of arctan .001. Three decimals is poor accuracy compared to more expensive competitors, but better than slide rules. Likely Sinclair was going after that large market. 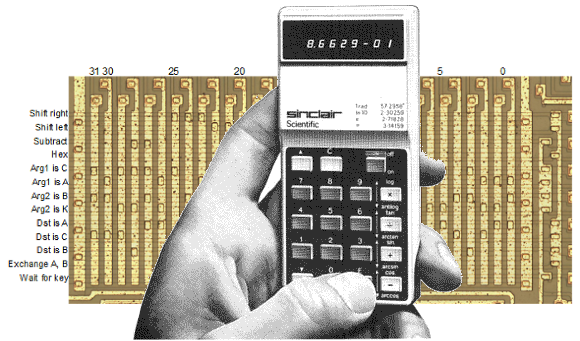 I've been reading through New Scientist magazines from 1975 and came across a couple of articles about strange Sinclair Scientific calculator behaviour - apparently it 'counts forward' or 'counts backwards' all by itself on occasion. How could that be? Is it reproducible on the simulator?